China is deploying its economic war to all fronts and the United States is not its only adversary. The Asian giant recently announced that imports of steel products from the European Union, Japan, South Korea and Indonesia will be investigated for alleged dumping practices. The measure adopted by the company Shanxi Taigang Stainless Steel has been supported by four other ones who asked the authorities to initiate an investigation into this commercial practice penalized in international trade. The Ministry of Communications of China announced that the investigation will be completed within a year, expectedly on July 23, 2019, although exceptional circumstances could extend it for another year, until July 23, 2020, detailed that regulatory body. Dumping is a commercial activity prohibited worldwide, since it is considered an illegal and unfair practice where a company establishes a lower price for the exported goods than for the production costs. It seems that the Chinese companies that filed the complaint with the Ministry of Commerce of their country have received the bad, or rather, the negative consequences of dumping, which generally affects local production companies. According to the report presented by the ministerial portfolio, the Chinese companies that sued produced more than 50% of the total sector between 2014 and 2017 in China; however, due to the sales of their foreign competitors, their income has decreased. 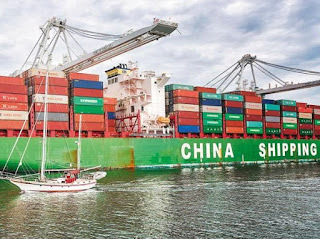 The plaintiff companies hope that a review corresponding to the aforementioned years will be held, as well as to another type of documentation that will allow proving that the foreign companies that exported to China dumped. As it has been revealed, the investigations will deal with the reports of January 1 and December 31, 2017, while the review of the damages to these companies will work with the corresponding data from January 1, 2014, to March 31, 2018. According to the statement presented by the Ministry of Commerce, the products analyzed are used as raw material for cold rolled stainless steel or for direct sale as final product for the construction of ships, containers, railways and for companies of the energy and petrochemical industries, among others. Contradictorily, although China is a major exporter of steel and the United States has penalized it with tariffs due to such overproductions, the Asian giant is a voracious dragon of natural resources. Only in 2017 China imported 703,000 tons of these stainless steel products, an increase of 200% over the previous year. 98% of these products came from the EU, Japan, South Korea and Indonesia. However, many economic analysts warn that this new movement in China may not bring the expected results. To begin with, it is very likely that such research will alienate potential allies that Asians could win in their trade war with the United States. As an aggravating circumstance, the Ministry of Commerce of the Asian giant announced the possibility of applying taxes on stainless steel products from the European Union, South Korea, Japan and Indonesia for dumping practices. If this measure is implemented, then the Asians would give ground in the battle with Donald Trump, it is known that Europeans, despite their discontent, see China as a possible ally against the protectionist and tariff policies that has been implemented by Donald Trump. However, Asians have not been able to seduce Europeans and South Koreans with the promise of increasing imports. The problem lies in Beijing's trade and industrial policy barriers that Europeans do not share, who are harsh critics of Trump's measures and tactics but many share American complaints. A month ago the head of European diplomacy, Federica Mogherini, made it very clear when she said: "The EU must defend its interests and our measures will be reasonable and proportional" but "we are not at war against any person". Likewise, she said at the time that Europe did not choose sides. "That is why we have decided to denounce the United States and China before the WTO", she justified the determination by reminding Washington that Europe also suffers from the consequences of global steel overcapacity. Ironically, Mogherini at that time also said that the old continent would appeal to existing 'anti-dumping' measures and not unilateral decisions, but now the ball has bounced off the wall and hit Europeans in the face. Trump dealt the first blow with his steel and has bled several world economies, both allied and enemy ones. Will the action of the American president work to bring down the Asian dragon?